December, 13, 2018 - BASF is breaking new ground in plastic waste recycling with its ChemCycling project. Chemical recycling provides an innovative way to reutilize plastic waste that is currently not recycled, such as mixed or uncleaned plastics. Depending on the region, such waste is usually sent to landfill or burned with energy recovery. But chemical recycling offers another alternative: Using thermochemical processes, these plastics can be utilized to produce syngas or oils. The resulting recycled raw materials can be used as inputs in BASF’s production, thereby partially replacing fossil resources. BASF said it has for the first time manufactured products based on chemically recycled plastic waste, being thus one of the global pioneers in the industry. “A responsible use of plastics is crucial to solve the world’s waste problem. This applies to companies as well as to institutions and consumers. With chemical recycling we want to make a significant contribution in reducing the amount of plastic waste,” said Dr. Martin Brudermüller, Chairman of the Board of Executive Directors and Chief Technology Officer (CTO) of BASF SE. “With our ChemCycling project, we are using plastic waste as a resource. In this way, we create value for the environment, society and the economy. We have joined forces with partners throughout the value chain to establish a working circular model,” said Brudermüller. BASF is collaborating closely with its customers and partners, which range from waste management companies to technology providers and packaging producers, to build a circular value chain. BASF is already developing pilot products, including mozzarella packaging, refrigerator components and insulation panels, with 10 customers from various industries. Manufacturing products that meet high quality and hygiene standards – which are specifically required for food packaging for example – is possible because the ChemCycling products supplied by BASF have exactly the same properties as products made from fossil resources. Stefan Gräter, head of the ChemCycling project at BASF, sees great potential: “This new way of recycling offers opportunities for innovative business models for us and our customers, who already place great value on products and packaging made from recycled materials but who cannot or do not want to make any compromises when it comes to quality.” As a next step, BASF plans to make the first products from the ChemCycling project commercially available. At the beginning of the production chain, BASF feeds oil derived from plastic waste by an oiling process into the Production Verbund. BASF gets this feedstock for the pilot products from the partner Recenso GmbH, Germany. As an alternative, syngas made from plastic waste can also be used. 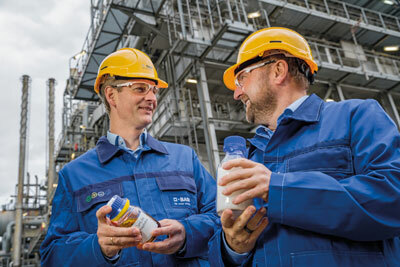 The first batch of this oil was fed into the steam cracker at BASF’s site in Ludwigshafen in October. The steam cracker is the starting point for Verbund production. It breaks down or “cracks” this raw material at temperatures of around 850 degrees Celsius. The primary outputs of the process are ethylene and propylene. These basic chemicals are used in the Verbund to make numerous chemical products. Under the mass balance approach, the share of recycled raw material can be mathematically allocated to the final certified product. Each customer can select the allocated percentage of recycled material. Both the market and society expect industry to come up with constructive solutions to deal with plastic waste. Chemical recycling is an innovative complement to other recycling and waste management processes. “We need a wide range of recovery options for plastic waste, since not every solution is suitable for each type of waste or possible for each product application. The first choice should always be the solution that performs best in a life cycle assessment,” explained Andreas Kicherer, sustainability expert at BASF. However, technological and regulatory conditions must be met before the project is market-ready. For one thing, the existing technologies to transform plastic waste into recycled raw materials such as pyrolysis oil or syngas must be further developed and adapted so that consistently high quality is assured. Furthermore, regional regulatory frameworks will considerably influence to what extent this approach can be established in each market. For example, it is essential that chemical recycling and the mass balance approach are recognized as contributing to the fulfillment of product and application-specific recycling targets. Plastics offer many benefits in technical applications, medicine and everyday life and they are often a better alternative to other materials. The challenge lies in responsibly managing post-consumer plastics. Functioning waste management systems and responsible consumer behavior with regard to plastics are crucial to solving problems such as pollution from plastic litter. To this end, BASF is involved in various projects at the association level and internationally. For example, the company is member of the World Plastics Council and participates in two programs of the Ellen MacArthur Foundation. Furthermore, BASF has implemented Operation Clean Sweep®, an international initiative of the plastics industry to prevent the loss of plastic pellets, flakes and powder in the environment. BASF’s new ChemCycling project is another milestone in the responsible use of resources and an example of how BASF is specifically addressing global challenges while also helping its customers to reach their goals.